It’s hard not to have a good time on a farm on a sunny August day, but even so, we’ve got to give credit to Cider Hill Farm owners Glenn and Karen Cook—they do it right. From the counterstaff who cheerfully directed us to the pick-your-own peaches to the signs that politely asked us to respect the orchards (rather than scolding us for even thinking of sampling the fruit) to the large, sunny store containing tons of locally-sourced products, Cider Hill is a delight for food lovers. The place to start your visit to Cider Hill is on the website, where you’ll find a detailed update on what produce is available in the store and to pick on your own. The day we were there, the peach orchards had just opened, and blueberry picking was in progress. Most of the peaches felt quite firm on the trees, but they softened to perfection almost immediately on our countertops. On the way to the orchard, we passed the Cook’s bee-keeping operation just off the main path as well as some of the farm’s gorgeous apple orchards. After picking as much fruit as we could carry and admiring the view from the top of the hill (vegetable fields, orchards, and far-off wind turbines), we ogled the goodies in the store, including a huge selection of Stonewall Kitchen products, an entire wall of farm-made jams and fruit spreads, and a great selection of gourmet pasta and soup/dip mixes. 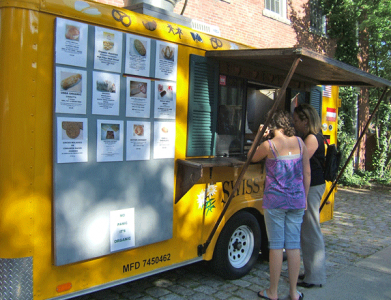 We noted many locally made food items such as mini-whoopies from Newburyport’s Chococoa, ice cream from Amesbury’s Hodgie’s, Gloucester’s Boston Chowda lobster bisque, Portsmouth’s Me & Ollie’s bread, granola from Marblehead (Chappaqua Crunch) and Boxford (Boxford Bakehouse), and soynut butter from Simple Food in Amesbury. Fresh foods include produce from the farm (we bought delicious strawberries from their late-producing crop and incredible butter-and-sugar corn), meat from Butcher’s Gourmet, and a variety of pastries. Our favorite is cider donuts, which are made fresh daily (expect to wait in line during apple-picking season if you want hot ones—but they’re worth it). Bags of donuts are available to bring home, as are frozen pies made on the farm and honey from the aforementioned bees. An enclosed hive gives a unique look at the daily lives of bees, delighting the less-squeamish among us. More kid-friendly are the outside pens with sheep, goats, and gorgeous red hens (you can buy their eggs in the store, of course). Many folks never think of visiting a farm until autumn, but Cider Hill is open May 5th through November 26th so there’s no need to wait for the fall enjoy the farm. And those delectable peaches are definitely worth the trip! There are a lot of things to like at the Salem Farmer’s Market. The gorgeous produce, of course, but also bonuses like organic European-style bread and pastries, lobsters from A&J Lobster, goodies from Nana’s Kitchen, ready-to-eat seafood from Rowand’s Fisheries, and live music. First, the produce. Our pick of farm stands is Green Meadows, which had a gorgeous display of all-organic vegetables including spherical zucchini and multi-colored chard. We also noted raw wildflower honey from Tomten Beeworks in Ipswich and adorable beeswax candles. The beets at Green Meadows were larger and better looking than the ones selling at another stand for the same price. Along with the abundant greens at stands like Long Hill Orchard and Clark Farm, we spotted new potatoes and bright-pink radishes. 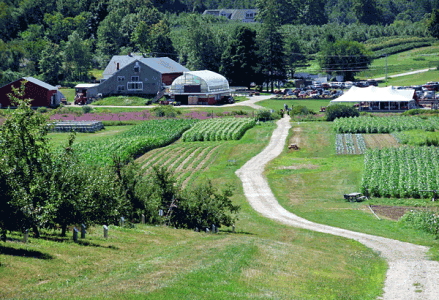 At the top of the courtyard, we were happy to find the much-smaller First Light Farm stand, which featured zucchini blossoms, organic eggs, and a selection of Valley View Farm goat cheeses. One last note on produce: we were there at 5:30 and saw several signs for raspberries, but no actual berries. If you want fruit, get to the market nearer to its 4:00 opening. We had never heard of The Swiss Baker, but we were drawn to Armand Bryl’s bright yellow truck and astounded by the breads and pastries for sale. Bryl, originally from Zurich, bakes once a week from his truck, just before market day. There was a great selection of fresh fish at the Rowand’s booth, including pieces of maple BBQ salmon for $8 and fish kebobs with a mix of salmon, tuna, swordfish, and halibut, also $8. Patrons looking for something to munch on immediately were buying lobster rolls ($10) and Maryland ($2) or natural ($3) crab cakes. The baked goods at the Nana’s Kitchen stand were almost sold out, and we could see why. The large brownies ($3) and double chocolate cookies ($1) looked terrific. These treats are sold mainly through retail outlets like Shubie’s in Marblehead. One last thing to like about the Salem Market: it’s right up the street from Artist Row where you can shop for lovely crafts, use the public restrooms, and have a refreshing cocktail at one of The Lobster Shanty’s outdoor tables.